Are you concerned about Lyme Disease? We can help by developing an Integrated Pest Management Program that can drastically reduce the chances of you and your family from becoming a statistic. Peace of Mind offers a four-application tick spray that will keep your play or work areas tick free. Please give us a call at 207-337-2773 or e-mail us at pomticks@maine.rr.com for more information. 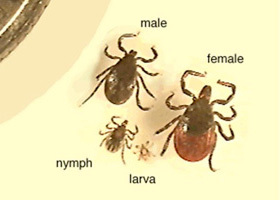 This picture is used to show the life cycle differences of the three common ticks in Maine. First the Blacklegged or Deer Tick, Second the Lone Star Tick, and third the Dog Tick. The three species show from right to left the larva stage, nymph stage, adult male, and adult female. It is very difficult see and feel the ticks when they are in their larva and nymph stages. When a tick settles in to have a blood meal the tick slowly holds all the blood that it is feeding on. The tick becomes disfigured by the time it is done and falls off its host. 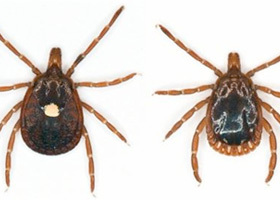 Adult American dog ticks are reddish brown in color, but can be distinguished from black-legged ticks on the basis of their large size (5.0 mm) and white markings on the perimeter of the dorsal scutum. Dogs (as the common name suggests) are the preferred hosts of adult American dog ticks but they will feed on other medium to large mammals including humans. The immature stages feed on small mammals, including meadow voles and white-footed mice. The American dog tick transmits Rocky Mountain spotted fever and Tularemia in the Eastern region of the United States. The female Lone Star tick has a characteristic white or yellow mark on the end of the scutum, from which the common name is derived. Both males and females are reddish brown in color and about 3.0 to 4.0 mm long. Tularemia and Ehrlichiosis are transmitted by this species. 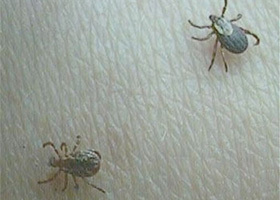 It has also been linked with a Lyme Disease-like illness called southern tick-associated rash illness (STARI) which may be caused by the spirochete Borrelia lonestari. The Lone Star tick does not transmit the Lyme Disease spirochete Borrelia burgdorferi. Lone Star ticks have a non-specific host preference and will seek blood meals from virtually any mammal.